1. 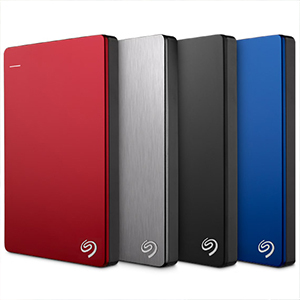 Coming in at No.1 is the 2TB Seagate Backup Plus Slim. This little beauty weighs 5.6 ounces and is incredibly thin for one of the most powerful hard drives on the market. Tests have shown it has a read speed of 87.2 MB/s and tested write speed of 85.7 MB/s. With a capacity of 2 terabytes this hard drive is mega! 3. The Transcend StoreJet 25M3 is third on this list. The Taiwan based Transcend have developed the StoreJet to add to their long line of memory and storage products. The drive is not only portable but is built to be more shock resistant than many others on the market to date so the company claims. The exterior design offers a rubberised jacket with an internal damper frame. The Transcend StoreJet is available in 3 versions, 500 GB, 1 TB and a huge 2TB. 4. WD My Passport Ultra Metal 2TB. Western Digital has a wide variety of disk storage in its My Passport range, but the 'Ultra Metal ' stands out above the rest due to - as the name might suggest - it 's solid metal design. The drive feels robust and resilient in the hand and is likely to stand up to any of the bumps and scraps you may encounter whilst out and about. Furthermore, the Ultra Metal drives comes with an ultra handy 46 cm cable - neat! Whether or not this will be a scratch magnet though may put some customers off. 5. Toshiba Canvio Basics 2TB. If you are all about the flashy gadgetory, I would suggest this may not be the hard drive for you - however, for a no frills and back to basics hard drive, this is a great choice. Toshiba has done things a little bit differently to it 's competitors by placing a raw disk with USB connectivity built into the Canvio Basics, meaning the complete portable hard drive is just 111 mm long making it one of the smallest hard drives available. The black plastic and quite frankly simple looking exterior doesn 't look amazing, but it 's a great size which can fit into any bag. 6. Seagate Seven 500GB , this super skinny hard drive has certainly got it going on. At just 7mm thick this nifty device can certainly go without being noticed in a shirt pocket! Seagate has achieved a great design here, which is sure to win over fans. Made from stainless steel with an industrial finish, the Seagate Seven is a real competitor with its sister 2TB Seagate Backup Plus Slim. Its a cool wedge of metal that can hold up to 500GB, not bad for it 's size! 7. The iStorage diskAshur Pro 1TB is perfect when you are keen to make sure your data is protected. Whether you are keen to keep your work data private or personal, this hard drive is perfect. A built in keypad that requires a personal PIN before you can access the hard drive is a nifty little addon that will sit well with people who take their privacy seriously. Plus it comes with a 1TB encrypted portable drive. 8. LaCie Mirror 1TB. Known for their style conscious and edgy products, this French company take a lot of pride in how their products look, which explains why they hire the best designers to get involved. Therefore this hard drive is mainly about the design and how nice it looks, it does have a 1 TB hard disk but really the focus is all on elegant design.